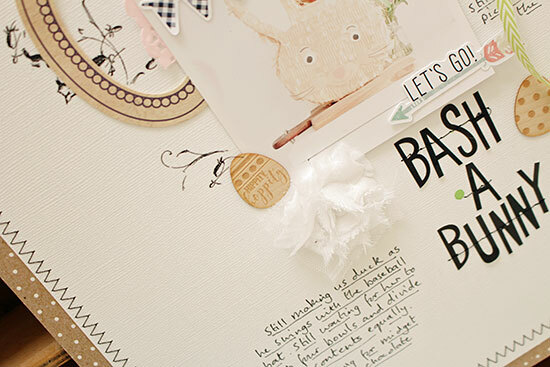 What's the best piece of scrapbooking advice you have ever been given? We chatted about this before, haven't we? So I'll be all "you're so right" when someone says "My advice? Stop talking about it and just do it.."
Seriously, though, whenever I'm asked this question I always tell the story of one of the first classes I ever took at Get It Scrapped, in which I learned the importance of adding a detail or two, not for luck, but for charm. Because it's that "charm" which will bring a page alive. 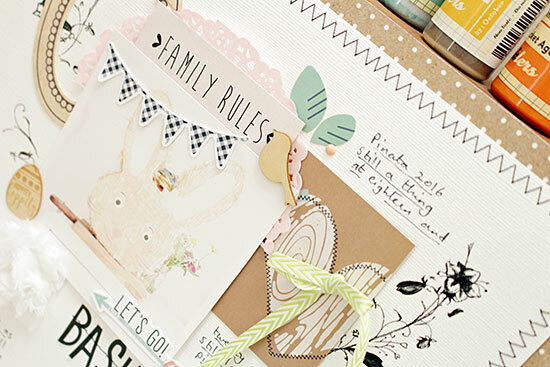 It takes any layout from scrapbooking by numbers - cut the paper, stick it down, add a title - and makes it personal, individual; and it's easy, then, to get a feel for what kind of a person a scrapbooker might be. And I think that's what we're looking for: make page about yourself, or your family, or friends, and what you are doing is telling us something about their character, or your own. Through the choices you make you can give away enough of yourself to charm your viewer and let her see the real you. And that will draw her in. I hope. That's what I try for. That's what I keep an eye out for when I'm admiring layouts in a gallery. If I think Ooh, look at that, I'll hit that Pin It button in a flash. What about you? What makes you pin? or stop? What delights you? And are you adding it to your own pages? Today I'm trying a white fluffy bunny tail. And a pair of ears which are, deliberately, a little tricky to spot. Because you know me: I'll have a go at anything, once. Oh lots of charm on this page - not just the ears and tail. I like the scattered journaling too. Ouch! I squirmed, seeing the title - surely they are not actually bashing bunnies in Sian's house, toy ones or no! So once I got,over the shock and took my eyes for a happy wander around your very pretty and not at all violent page, I was indeed charmed. It's the lovely colouring of this one and the fine black lines and tracery that grab me today. You hit this one out of the park, again .. I actually read this post at work...with that title it was necessary to find out what you were up to immediately....I do totally love those little things we add that make a page ours! hugs for that fluffy tail! I'm thinking "charming" would be a good descriptor for so many of your pages. I'm so far behind that the advice at the top of your post is what I need most! Your pages are always charming. I love all the little details you add. I agree about our pages reflecting our personalities. I tend to be very linear in my approach---which completely sums me up---I'm on the straight and narrow---always! I'm very massive fan of stickers. It stops me hoarding packets and packets! That is a lovely, charming layout. My tip would be that if a layout isn't coming together how you'd like it to then put it to one side, move on to something else and then go back to it. 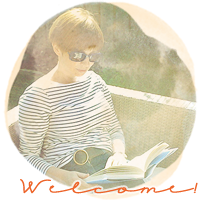 so much dimension and visual interest in your page Sian! It truly is pure "eye-candy"
I especially like to see all the bits & pieces on layouts, the little details & the big ones that help tell the story & highlight great photos. I just had a good look about, which I haven't done in quite a while. And there's so much I want to say. Starting with your Mari post and realizing it's been four years since we all met and took that wonderful tour 'round Belfast. And thoughts about your girl finishing up dance and your boy going to an internship - so similar to where we are now. And, then, "get your muse goggles on!" That could be my motto for the summer. Nice to catch up with you. Hope to be around more often. 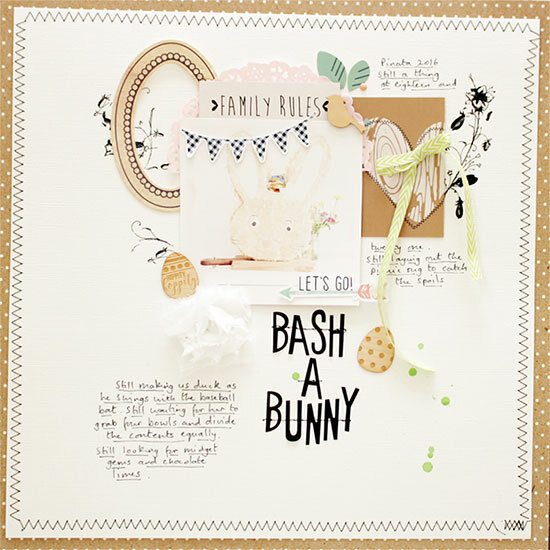 Don't know how I missed commenting on this first time around ... super lovely page, although you are making me think of Glenn Close as the bunny boiler in Fatal Attraction! It is when I know I've got time/energy/motivation to think and add the bits for charm that I really enjoy the creative process. Takes me longer to find that much time at the moment but it is a good thing to remember - thanks for that inspiration.